The handle of the CHROMA type 301 – Design by F.A. Porsche is constructed of stainless steel, and the blade is made of high-quality Japanese 301 steel. The blade of each knife is carefully razorsharp sharpened by the hand of a master. Never place the knife in the dishwasher. Hand wash and dry after every use. Regularly sharpen the knife using the original Type 301 whetstone. Under no circumstances should a sharpening steel be used, as it will damage the blade. Store the knife in a safe, secure manner, for example, in a knife block so the blade is not left exposed. Only use wooden or plastic cutting boards, never marble or glass when cutting with a Type 301. Only use the knife to prepare food. 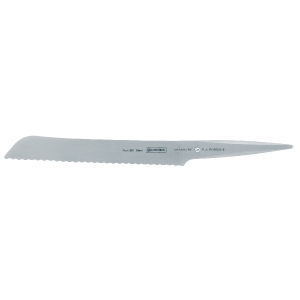 Do not use it to cut frozen foods, bones, or as a utility knife.